Bats have long captured the imaginations of scientists and engineers with their unrivaled agility, but their complex wing motions pose significant technological challenges for those seeking to recreate their flight in a robot. 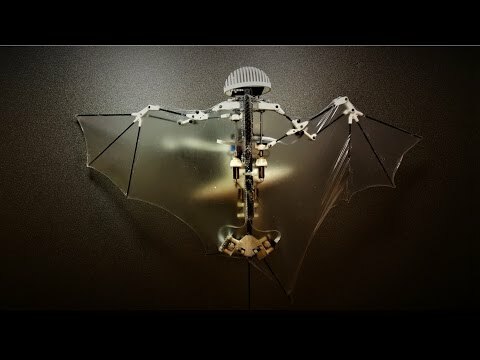 The key flight mechanisms of bats now have been recreated with unprecedented fidelity in the Bat Bot—a self-contained robotic bat with soft, articulated wings, developed by researchers at Caltech and the University of Illinois at Urbana-Champaign (UIUC). Chung, who joined the Caltech faculty in August 2016, developed the robotic bat, along with his former postdoctoral associate Alireza Ramezani from UIUC and Seth Hutchinson, a professor of electrical and computer engineering at the UIUC and Ramezani's co-advisor. Chung is the corresponding author of a paper describing the bat that was published on February 1 in Science Robotics, the newest member of the Science family of journals published by the American Association for the Advancement of Science. The Bat Bot weighs only 93 grams and is shaped like a bat with a roughly one-foot wingspan. It is capable of altering its wing shape by flexing, extending, and twisting at its shoulders, elbows, wrists, and legs. Arguably, bats have the most sophisticated powered flight mechanism among animals, which includes wings that have the capability of changing shape. Their flight mechanism involves several different types of joints that interlock the bones and muscles to one another, creating a musculoskeletal system that is capable of movement in more than 40 rotational directions. "Our work demonstrates one of the most advanced designs to date of a self-contained flapping-winged aerial robot with bat morphology that is able to perform autonomous flight," Ramezani says. One of the key challenges was to create wings that change shape while flapping, the way a biological bat's do. Conventional lightweight fabrics, like nylon and Mylar, are not stretchable enough. Instead, the researchers developed a custom ultra-thin (56 microns), silicone-based membrane that simulates stretchable, thin bat wings. Bat-inspired aerial robots have the potential to be significantly more energy efficient than current flying robots because their flexible wings amplify the motion of the robot's actuators. When a bat—or the Bat Bot—flaps its wings, the wing membranes fill up with air and deform. At the end of the wings' downward flapping motion, the membranes snap back to their usual shape and blast out the air, creating a huge amplification in power for the flap. The design has potential applications for environments where more traditional quadrotor drones—which have four spinning rotors—could collide into objects or people, causing damage or injury. The study is titled "A Biomimetic Robotic Platform to Study Flight Specializations of Bats." This research was funded by the National Science Foundation's National Robotics Initiative. Soon-Jo Chung, associate professor of aerospace and Bren Scholar at Caltech, holds the Bat Bot.